On a recent trip, a friend and I stopped by a Bent and Dent store (I guess that is what you would call this place). It's about 11 miles out in the country from where we live. We had heard that you could purchase can goods and other items cheaply. We just wanted to check it out. It is a nice little store and full of various items. I got 2 jars of bread and butter pickles for 50 cents each. They were out of date by almost a year. I tapped on the lid and the seal seemed to be fine. I thought, at that price, it wouldn't hurt to see if they were good. 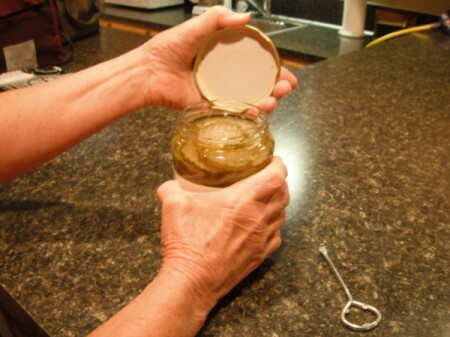 For dinner that night, we tried a jar and found them to be delicious. Several days later, I called Susie and asked her if she had tried hers. She said, "No, I can't get the jar open." I told her how I open jars and wondered how many others have that same problem. I decided it may be a good tip to share. 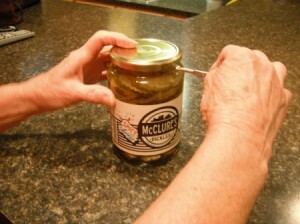 I use a paint key to open jars, especially pickle. It fits under the lip of the lid. 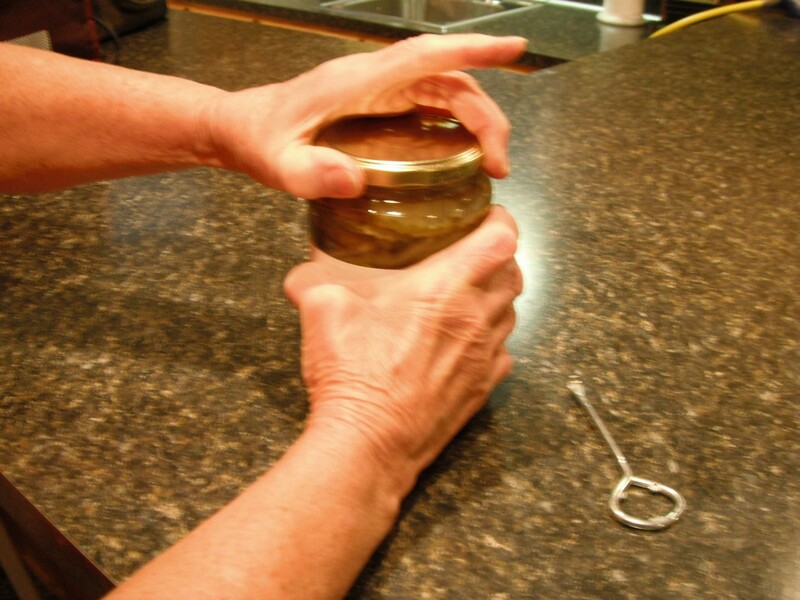 When you press down on the handle, it releases the vacuum which breaks the seal and makes the jar easy to open. If you don't have a paint key, you can pick one up at most any hardware store that sells paint. Susie was going out of town and would be passing by that same store again. She called me and asked if I wanted any more pickle. I told her to get all they had and we would split it. They just had 2 jars left. It was sweet and spicy which turned out to be just as good. Fifty cents for a 24 fl. oz. jar of pickle is a bargain! You can also use the spoon end of a teaspoon to release seals on any jar. Just put tip of spoon under lip and pry up. Works like a charm. My Mom and Grandmother taught me to do this. Also works for loosening rings and lifting lids on home canned goods. I also have found the pointed end of a bottle opener works really well too. it fits under the lid and has a long handle for gripping. Trying to open sealed jars are a big pain in the hand. Great find on the canned goods. Keep in mind the date on the cans and jars are not regulated, they are determined by the manufacture. If they put a short date on the jar, you pitch it and buy more. Job security? Food can be safe for years after the date. Good idea that I'm definitely going to try. Thanks.